After months of long wait, Samsung Galaxy A3 starts receiving Android Nougat Update. Samsung Galaxy A3 is the cheapest smartphone in the Galaxy A series. Android Nougat update for Samsung Galaxy A3 is now available. If you are from Russia, Then you are the first to get Android Nougat Update for Samsung Galaxy A3 (2017). 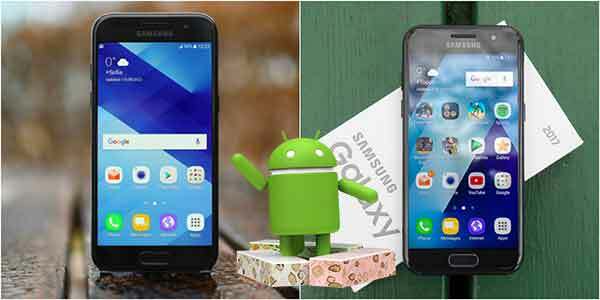 In India, Samsung Galaxy A3(2017) Will soon get Android Nougat Update. Presently the Android Nougat Update for Samsung Galaxy A3(2017) is available in Russia and soon it will be rolling out in other countries. The Android Nougat update for Samsung A3(2017) is currently available in Russia. If you want to download the Android Nougat update for Samsung follows these steps. Go to Settings of Phone>>About phone>>Software Update. You will automatically be notified by Samsung for updates too. The Android Nougat Update for Samsung is around 2.2GB. Just charged you phone updates will not be downloaded or installed if your phone battery is less than 50%. So make sure your phone is fully charged. Samsung Galaxy A3 2017 variant was launched in the month of January this month. The phone comes with a 4.70-inch touchscreen display. The resolution of the display of Samsung Galaxy A3 is 720×1280 pixels. The phone is powered by a 1.6GHz octa-core processor. Galaxy A3 comes with 2GB of RAM and there is 16GB of internal storage on the phone. However, the storage of Galaxy A3 (2017) can be expanded by means of microSD card up to 256GB. Galaxy A3 (2017) runs on Android Marshmallow operating system but soon it will be upgrading to Android Nougat OS. Coming to the camera specification of Galaxy A3(2017), the phone comes with 13 megapixels camera at back with Flash and for selfies and video calling the phone comes with an 8-megapixel camera at front. The battery of Samsung Galaxy A3 (2017) is of 2350mAh. Connectivity options of the phone include Wi-Fi, GPS, Bluetooth, NFC, Headphones, and FM.